Download for free then let you and your kids play with Microsoft latest Fresh Paint for Windows 8. Screenshots and adding caption it what I used to do with paint but with this Fresh Paint app for Windows 8 you can become more creative more realistic. Imagine what you can, don't worry about your errors and mistakes as undo and erase will handle it for you. Here's new things you can experience when using this paint application for Windows 8 users. It's different than your normal MS paint app that we use to have since Window XP. Zoom in to see strikingly realistic details. Only Fresh Paint has an amazing, realistic paint engine developed by the company that brought you Kinect. 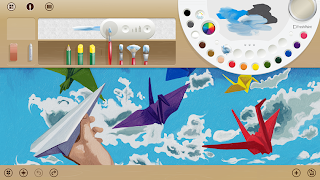 If your new to Windows 8 you can download this Fresh Paint App available in Microsoft website.